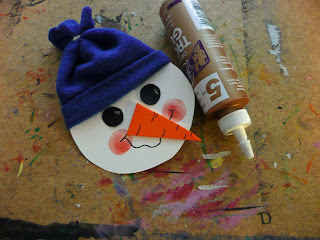 Here is one of the crafts the kids will be doing for our 2010 Christmas Craft Day. It is a repeat of one we did 4 years ago. 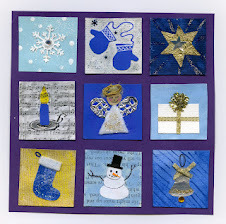 (I have to wait 4 years before I can repeat crafts so the kids do not get any doubles). 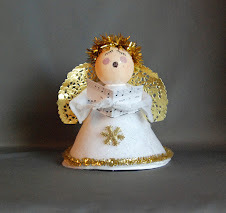 It is based on a project by Leslie Johnston that was in "Pack o Fun" in 2004. I made some changes and it is now a quick craft that we can easily cycle 150 kids thru lickety split. 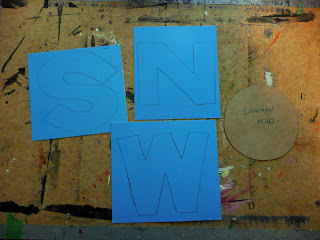 I cut out pieces of posterboard that are approximately 6 inches square. I like using blue. 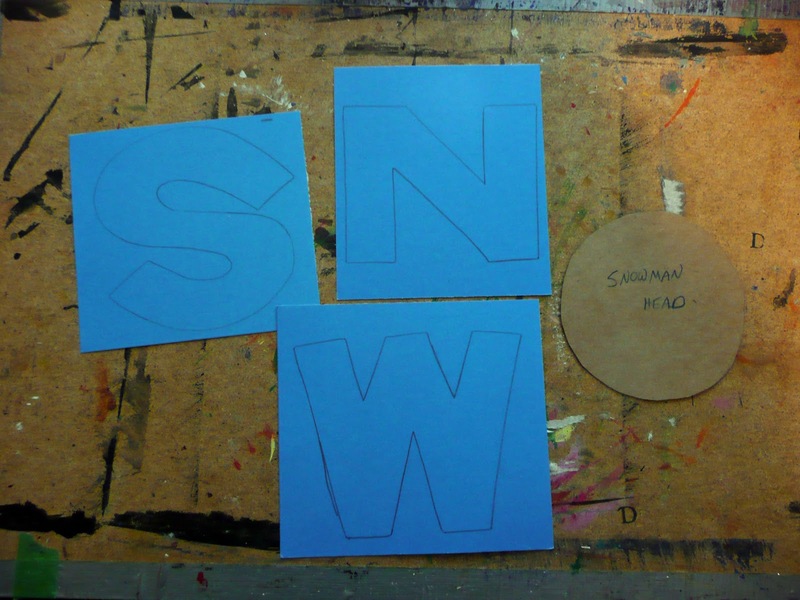 I then trace out the letters SNW for the kids to cut out. 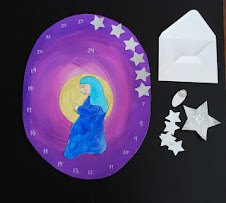 If you have more time you can get them to trace it out or have them design their own letters. 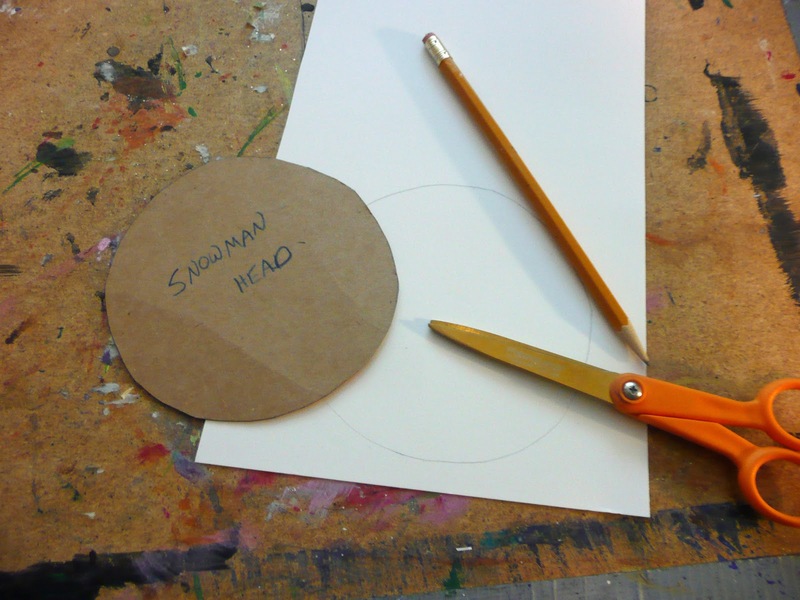 Using a circle template we then trace and cut out the snowman head. The original design had scarves for the snowman but I found them hard for the kids to manipulate so we use hats. I take some fleece fabric and sew it into a long tube on the machine. 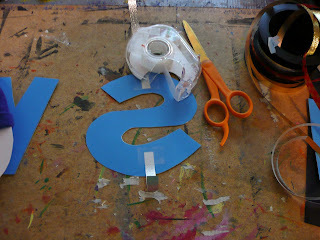 I then cut it into sections. 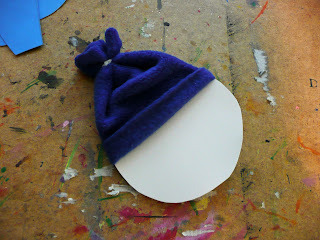 The kids take a piece of yarn and tie off the top of the hat, roll up a brim, and slip onto the head on an angle. 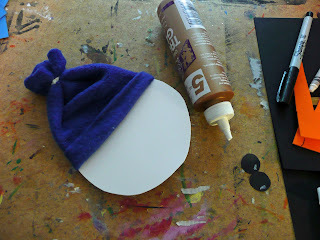 Using tacky glue secure into place. We then cut out 2 eyes out of black paper. 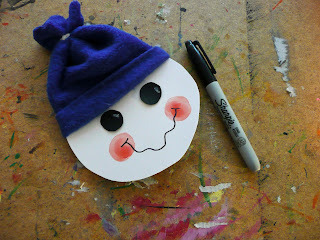 Using a white crayon make a little highlight line in each eye. Glue into place ensuring the highlight is in the same position for each eye. 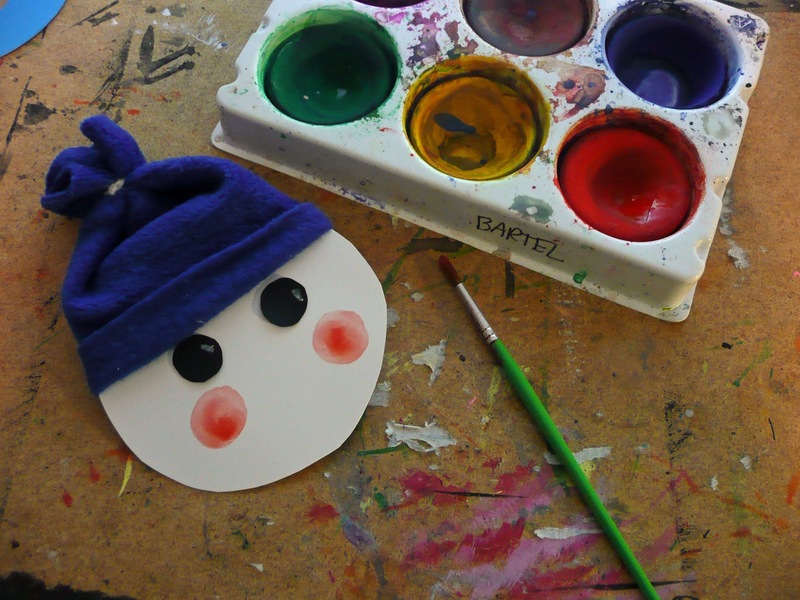 Using disk tempera, paint on some rosy cheeks. When the cheeks have dried use a sharpie to draw in a crooked smile. 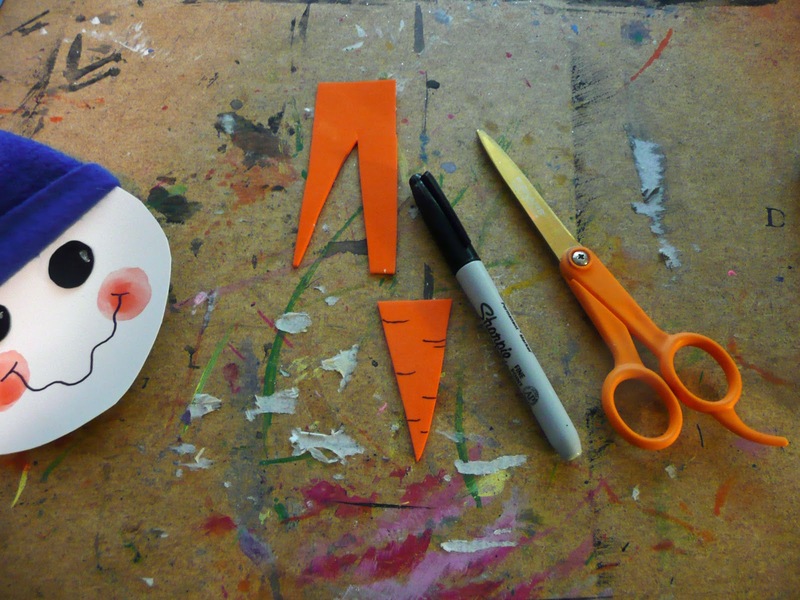 Cut a carrot nose from orange paper, craft foam or painted paper. Using a sharpie draw a few lines on your carrot. Make a hanger with a loop of ribbon and tape into place at the top of the S. Then tape a longer piece of ribbon at the bottom of the S for hanging the rest of the letters on. You may wonder why I didn't just use one long piece for the whole thing but I find the ribbon distracts from the S letter so I like it better this way. We staple the top of the snowman hat to the bottom of the N to keep it balanced otherwise the snowman flops over and the banner doesn't hang right. 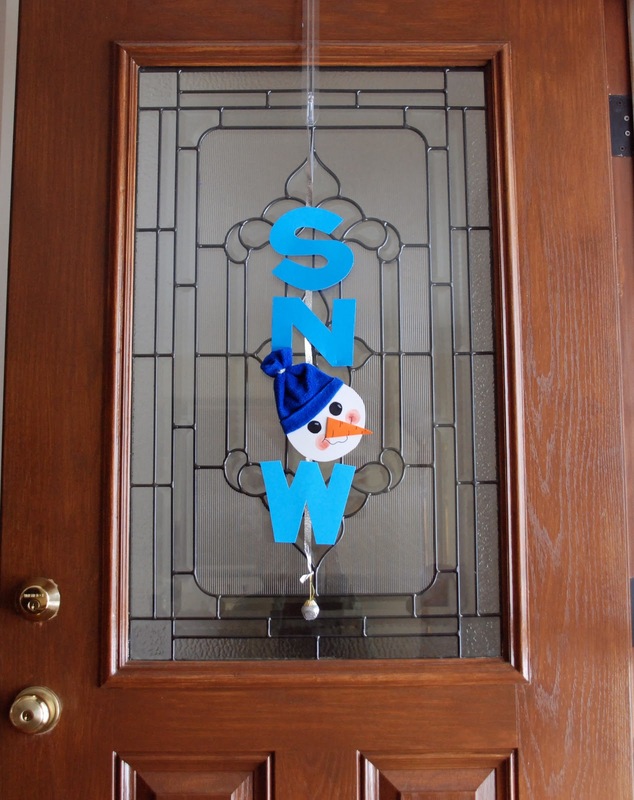 We also tie on a Christmas bell at the end. I find these at Wal-mart, 21 bells for $6.00, in the Holiday section. 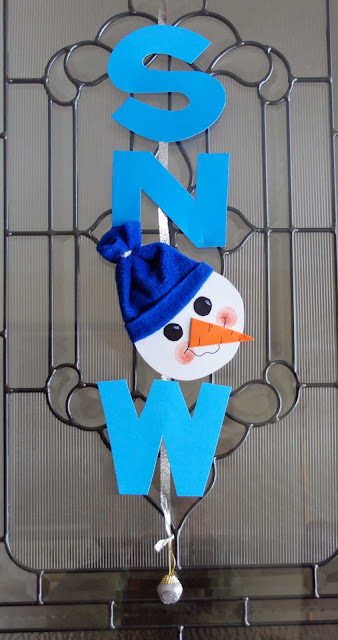 That's it, a great little door banner that is easy to make, perfect for our Craft Day. 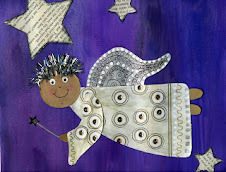 Thanks everyone!...hey Leslie if you have a blog or website I would love to link it for this project! !